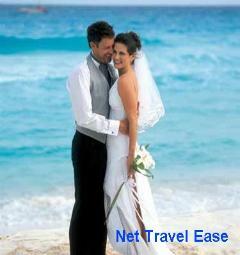 Bahamas Packages available with Island Ceremony or Cruise Ship weddings! port in the United States and will be under Florida law. beach that is waiting just for you. beautiful island resort, or ship wedding. The Mini Wedding Package is priced at $559 (US$). The Classic Wedding Package is priced at $690 (US$). people at Viva Fortuna Beach's La Trattoria restaurant. party arrangements are also available. The Wedding Renewal package costs $369 (US$). His & Her island inspired welcome cocktails. His & Her Massages (50 Minutes). and Bar (not including alcohol). Fresh Baked Pastries delivered each morning. Bahamas no later than Thursday. No blood test is required. License cost is about US $40. letter must be an original on the ship's letterhead). Documentation Required: Passport or birth certificate and driver's license. official application for a Bahamas marriage license. If widowed, certified copy of spouse's death certificate. English and notarized prior to their arrival in The Bahamas. in the Bahamas for 24 hours before they can apply for a marriage license. for the cost of the hotel stay and transportation to get to the destination. lunch and seven-course dining in the famous Grand Bahama Grill.